Wedding season is about to kick into full gear and while it may be the happiest time of your life; you don’t want to drain your savings account during the planning. 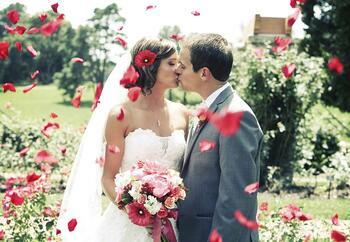 Here are some tips to help make your nuptials special without breaking the bank. This is probably the most important part of planning of wedding. If you and your future spouse are planning on paying for the wedding yourself, sit down and decide what you can realistically spend on the big day. You don’t want to come home from the honeymoon to a pile of wedding bills that you can’t afford to pay. If parents or other family members are helping to contribute to the wedding fund, keep them in the loop throughout the planning so they know how their money is being spent. Decide what aspects of a wedding are most significant to you and create a list by priority. This will help you to determine how to allocate your budget as you begin planning. If food is the most important thing, put more money toward that. If you don’t really care about wedding favors, maybe cut that out entirely. While you may not be able to fulfill every last detail of your dream wedding, you can make the most important things become a reality. It’s okay to be picky about who you invite. While there are some people outside of your immediate circle of family and friends who have to come (either because you truly want them there or just want to avoid an uncomfortable situation later) even just a few extra people can potentially tack on hundreds to your wedding bill. If you are paying for the wedding, you can pretty much invite (or not invite) whoever you want. Obviously, you want to avoid any hurt feelings during this process, but just make it very clear that you are paying for the wedding yourself and you have a very strict budget or that your venue only allows so many people. This can apply to both your flowers and your food. Having to ship things in can get pretty expensive pretty quickly, so do some research and select items that you can get nearby. If the flowers you want are out of season, talk to your florist. He or she may be able to suggest an alternative that has the same look, but will cost a whole lot less. The most popular months in the United States for people to get married are June, September, and October. If you are looking to save a little money, choose a date outside of these months. The weather may not be as predictable, but you can save money on venues and entertainment as they aren’t in as high of demand. It’s your wedding and there are really no rules anymore dictating what you can or can’t do. If you don’t want to spend money on a giant cake, opt for cupcakes, an ice cream bar, or even mini versions of your favorite desserts. Your wedding should be a reflection of your personality and if some of your unique aspects can also save a little money, then it’s just an added bonus.